However, as of late, land and labor protests have been at the center of national (and international) news. Unfortunately, many of these protests have ended in violence. In February, for example, thousands of garment workers had gathered to demand better pay and working conditions when the governor fired into a crowd, wounding three women. 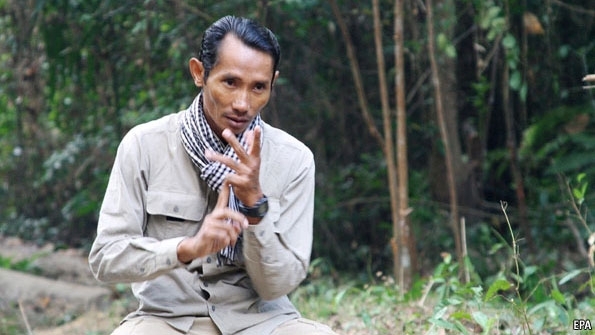 Then, last month, a prominent environmental activist, Chut Wutty, was shot and killed by a government official while attempting to expose the dangers of the widespread illegal logging industry. The most recent demonstration has been land grab protest in Phnom Penh. One day last week, a group of women made a radical statement by stripping down to just their underwear in front of the National Assembly. Then, the following day, five women were injured by riot police. So it appears the spirit of protest does exist in Cambodia, despite the risks. In an age when one lone fruit seller or a single tweet can change the political landscape of an entire region, it’s hard to know if these protests will be the catalyst for any bigger movements. Either way, I think the protests– and the subsequent responses– provide an interesting look into current Cambodia. It certainly is a country ripe for change.